Katie Kim and Crash Ensemble are bringing their unique collaboration Salt Interventions to Dublin’s Grand Social for a debut Dublin performance on Saturday 8th April, as part of the popular MusicTown festival. Salt interventions takes musical adventurer Kim into bold new territory, working with Ireland’s leading new music group Crash Ensemble. Crash, renowned for their own brand of boundary-pushing music, have of late themselves been hanging out with an eclectic group of artists – the likes Bryce Dessner (The National), Richard Reed Parry (Arcade Fire), Sam Amidon, Adrian Cowley and Íarla Ó Lionáird (The Gloaming). RTE Choice Music Prize shortlisted Katie Kim is no stranger to collaboration, having worked with the likes of David Kitt, Adrian Crowley, Milosh, and The Waterboys. Arranged by composer Sean Clancy for especially for the Crash players, Salt Interventions adds texture to Salt’s dreamlike minimal style with violin, viola, cello, double bass, clarinet and percussion. Clancy’s work has been commissioned and performed by many of the world’s leading ensembles and artists, and he has developed particularly close ties with the RTÉ National Symphony Orchestra, the BCMG (Birmingham Contemporary Music Group) and Crash Ensemble. This performance will be Katie Kim’s first headline show since her sold out performance at the Unitarian Church last October. Salt was recorded in a self-built recording and artist space in Dublin called Guerrilla Studios and released October of 2016 to critical acclaim – the album been shortlisted for the the 2016 RTÉ Choice Music Prize, with the winners to be be announced at live event, held in Vicar Street, Dublin on March 9th. 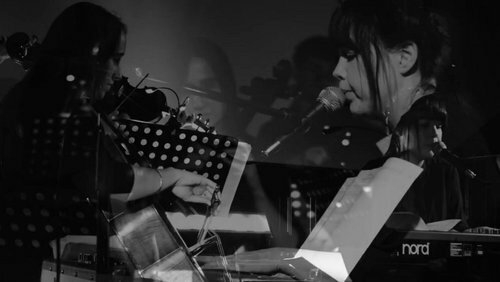 Katie Kim and Crash Ensemble: Salt Interventions, Saturday 8th April, Grand Social, Dublin – tickets here.